You can count on Eosso Brothers Paving to keep your asphalt safe, durable and attractive. Specializing in both commercial and residential asphalt, we have been proudly serving Monmouth County for the last 27 years. 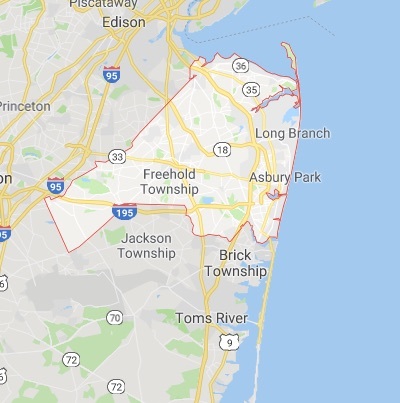 Monmouth County, NJ has a population of 630,380 and is known as the `Golden State’. It has a long history that dates back to the American Revolution. In recent years, it has welcomed waves of immigrants including Asians, Dutch, and Latin Americans. No matter the time you visit, you’re guaranteed to have a great time. The county offers fun and entertaining attractions for people from all walks of life. Whether its winter or summer, the Asbury Park sparkles. You can take 90 minutes tour to cover the fascinating stories and architecture that played a big part in history. For daylight fun, the Silverball Museum Arcade has your back. While there, you can spend the night at Hotel Tides Restaurant & Spa or The Empress Hotel. Just sit at the communal tables and sample the exquisite menus. If you want to understand the heritage of the county, simply walk to Bridgeton Hall of Fame Sports Museum. There are multiple artifacts and art gallery with different expressions to admire. To liven your holiday with laughs or classical music, simply walk to Count Basie Theater. The children are not left behind. You can take them to the Children’s Museum of Arts. Here, they can explore the multiple facets of art like painting, sewing, and sculpting. Monmouth has beautiful barrier islands and white-sand beaches that draw thousands of visitors every year. Most of them will charge a small fee to cover the cost of maintaining a clean, safe beach. The Keansburg beach is perfect for those people who like to hit the waters during the sweltering summer months. But if you want to spend a whole weekend outdoors, you can visit Belmar beach. It allows bonfires and picnics at a designated area. There are also some food stands, outdoor cafes, and small shops. Want to do some hiking? The entire county has excellent places for hiking- trails may head across rolling hills, mountains, boardwalks, Pine Barrens, and forests. Why not try these places while you can? Wherever you plan to go, Monmouth County, NJ will meet and exceed your expectations. Our team was recently out to a local business that was in need of significant parking lot repairs. Their business was located near a very popular Monmouth County destination and needs help before the traffic increases. We will be adding photos and details to this post as the project progresses. Be sure to check back in!